Starting an effort that could take years, a state entomologist places 700 flies, in their winter cocoons, in a box behind the Grace Episcopal Church. BATH — As part of the ongoing battle against winter moths in the midcoast region, an entomologist with the Maine Forest Service placed hundreds of parasitic flies in Bath as a biocontrol for the moths. The winter moth is an invasive species that has caused extensive damage in the region since they were first discovered in the state back in 2012. As caterpillars, winter moths eat the leaves of deciduous trees, causing defoliation that can harm, and eventually kill, the trees over several years. While Bath City Arborist Kyle Rosenberg didn’t have a number of how many trees winter moth had damaged in the city, he estimated the insects had impacted 375 acres of forest. Now, the city is partnering with the state to tackle the unwanted pest. 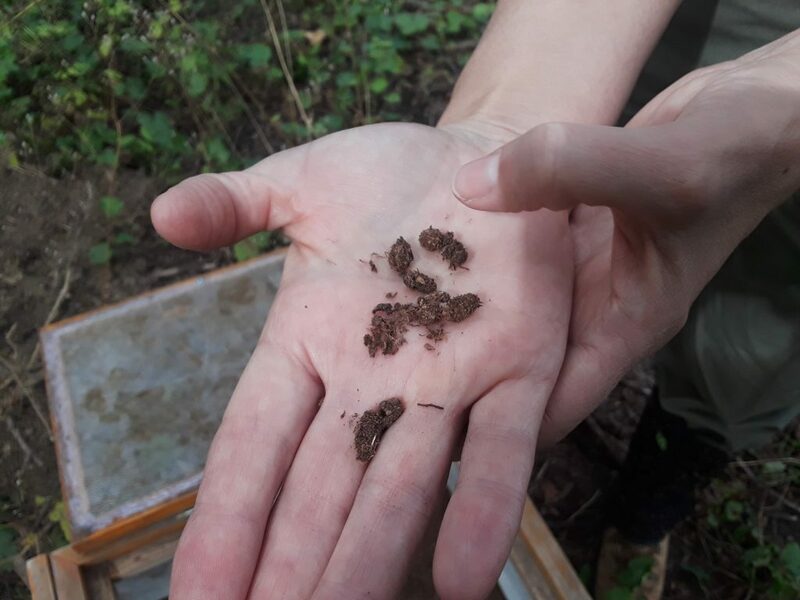 On Wednesday morning, Maine Forest Service Entomologist Colleen Teerling placed a small screened box with 700 of the flies, which are currently in their winter cocoons, behind Grace Episcopal Church. In the spring, the box will be opened, releasing the flies to prey upon the winter moth. Teerling noted that the impact won’t be immediate, and it will take a while for the flies to spread out over the midcoast. While some residents might want a faster solution, that’s fast for a biocontrol agent, she added. For those looking for immediate relief from the winter moth, Bath will be holding a banding class, later this month where residents can learn how to wrap the trunks of their trees to prevent the caterpillars from climbing them. “We did that last year and probably had 250 trees throughout this area banded,” said Rosenberg. As a biocontrol agent, the parasitic flies target only the winter moths, meaning that they won’t have a significant impact on other insects. Like the winter moth, the flies are originally from Europe and have been introduced to the region to reduce the winter moth population. “This is something that we envision basically dealing all up and down the coast, taking care of the winter moth,” she added. According to Teerling, the flies are a tried and true biocontrol agent, having already decimated winter moth populations in Massachusetts and Nova Scotia. Rosenberg said they chose the location because it is forested, isolated and unlikely to be disturbed. It’s also part of a small forested corridor in Bath that will help the insects spread out over the city. Unfortunately, the flies only target the winter moth, leaving other invasive species like the browntail moth and the emerald ash borer uninhibited. The browntail moth has plagued Bath for several years. Like the winter moth, the browntail moth can also cause serious damage through defoliation, though the browntail moth has the added feature of being covered with hundreds of tiny, barbed poisonous hairs in their caterpillar stage. The hairs can cause rashes like poison ivy when they come into contact with skin, and if inhaled can cause respiratory issues. Teerling noted that while the browntail moth is a major issue in the Bath area, it’s far less widespread in New England than the winter moth, which means there are less resources working towards solutions to the hairy fiend. While biocontrols like fungus have curbed the population at times, researchers have yet to find a silver bullet for the browntail moth like they have for the winter moth. Adding to the decimation of Maine forests is the emerald ash borer. An invasive species which can kill ash trees, the emerald ash borer has existed in bordering Canada and New Hampshire for years, although Maine remained free of the unwanted bug. Earlier this year, however, the emerald ash borer was found in Aroostook County, and on Wednesday the Maine Department of Agriculture, Conservation and Forestry announced that the insect had been found in western York County. Although the city of Bath is already working to mitigate the threat, it could take years for the insect to arrive in the city. The state claims that there are no practical ways to control the emerald ash borer, although individual trees can be protected for a price.